Now that the weather is getting warmer it is time to start thinking about summer swimming. Attached is the 2019 registration form and practice schedule. Registration deadline will be May 31st. We will have these posted on the Rockville website. We are still looking for additional volunteers for certified positions. We need one or two people that can do the computer work at the meets as well as some additional stroke and turn judges. If you are interested in S&T you will need to attend training a training provided by GRAL. Please let us know if you are interested and we can get you the training dates, or they are available on the GRAL website. There is no training for the computer position with GRAL, but we will get you training. Look for additional information on a parent meeting to be scheduled in April. Posted in News, Uncategorized	| Comments Off on Rockville Racers: 2019 Registration Now Open! The Rockville Center is currently seeking a qualified Pool Manager. The Pool Manager is responsible for all operations and activities at the Rockville Pool. The Pool Manager can expect to work an average of 20 to 25 hours per week while the pool is open between May and September. Additional time will be required before the pool opens. Responsibilities include, but are not limited to, hiring and supervising life guards, running pre-season training, helping prep the pool and facilities for opening, creating/maintaining life guard work schedule, coordinating rentals and helping with post-season clean-up. In cases of emergencies or gaps in the schedule, the Pool Manager may take the stand as a lifeguard if necessary. This is a salaried position. Required qualifications: Current Lifeguard Certification, Current CPR for Lifeguards or CPR for Professional Rescuers and Pool & Spa Certification. Certifications must be valid upon first day of employment and may not expire during term of employment. To be considered for this position, please email your resume to rockvillecentermembers@gmail.com or mail to The Rockville Center, P.O. Box 111, Rockville, VA 23146. The Rockville Pool is currently accepting applications for 2019 lifeguard positions. If you are interested in applying to be a lifeguard, please download the application and email it back to us at rockvillecentermembers@gmail.com OR mail to The Rockville Center, P.O. Box 111, Rockville, VA 23146. * Current Lifeguard Certification up on first day of employment. May not expire during term of employment. * Current CPR for Lifeguards or CPR for Professional Rescuers certification upon first day of employment. May not expire during term of employment. Please download and complete an application. You will need a copy of your completed application when you interview with the Center. Who can join the Rockville Racers Swim Team? The Rockville Racers Swim Team is open to children ages 18 and younger of families who are members of the Rockville Center Pool. Team members must be able to swim across the pool. We have a Jr. team for children (typically ages 5-7) who can swim, but not yet across the pool. A date will be scheduled at the beginning of the season for evaluations of young swimmers to determine if they can join the Jr. team. How much does it cost to join the team? The 2019 swimmers’ fees are $85.00 for the 1st swimmer, $150.00 for 2 swimmers, $205 for 3 swimmers, and maximum of $260 for 4 or more swimmers. Additional costs to the swimmer may be associated with the purchase of swimsuits, caps, goggles, or spirit wear. What if my child isn’t a strong swimmer or doesn’t know all the strokes? The Rockville Racers is comprised of swimmers at all skill levels. Swim team is a great way to learn and improve in an encouraging and fun environment. Regular practice attendance will typically result in significant learning and improvement for a swimmer over the course of the season. Swim team begins mid-May and extends to mid-July. Expect 3-4 weeks of training before the first meet. The season consists of six meets held weekly (usually on Wednesdays). The 2019 meet schedule will be 6/12 (tentative), 6/19, 6/26, 7/3, 7/10, and 7/16. If your child qualifies for Champs, practices will continue through July and the Champs meet will be held on 7/27 and 7/28. There are both morning and evening practices held throughout each week. You do not have to attend all the practices. You pick and choose the ones that work for your schedule and how many times a week you would like your child to practice. What is the meet schedule? There are six meets in a season, three home and three away. Typically, the meet schedule starts at 4:30PM with check-in and warm-ups and the meet officially begins at 6PM. Each meet is divided into two halves. Younger swimmers (8 and unders) swim in the first half and are usually finished by 8:30PM. What if my child will miss a meet? If you know ahead of time that you will not be at a meet, please email rockvilleracersteam@gmail.com and notify the coach as soon as possible, but AT LEAST two days prior to the meet so the coaches do not schedule your child. Missing swimmers especially impact relays and it takes a lot of work to redo the relays if the coach finds out later that a swimmer will be absent. What should I bring to a meet? How do I know how well my child did in his/her event? Each meet will have a designated area where event results are posted. Your child will be grouped with other swimmers by age and swimming ability for their finish place. The five categories, which are determined by time (based on event, age, and gender), are Novice, Advanced, Junior Varsity, Varsity, and Senior Varsity. Any time that is in the JV, V, or SV category qualifies your swimmer for Champs. Your child may win his/her heat, but not win first place in the event. Yes! Meets are made possible solely by the efforts of our amazing parent volunteers! With approximately 50 positions (each position is for either first or second half of the swim meet, NOT the whole thing) to fill for each meet, it is mandatory that at least one member from each family volunteer one half of each meet. No matter what position you fill, YOU WILL BE ABLE TO WATCH YOUR CHILD SWIM! Most positions require no formal training (like timing—you get to watch all the swimming and get to know other swim parents) and are easy and fun. A few (such as Strokes & Turns Official) require training and certification by GRAL. A SignUpGenius link will be emailed once the season starts to secure volunteers for each meet and a description of each volunteer position and its responsibilities will be provided. GRAL stands for the Greater Richmond Aquatic League. We belong to this league with 29 other teams. The teams are broken into divisions (determined based on past performance and team size). Our division determines the teams against whom we compete. See the GRAL website for more info. We are so glad you are interested in finding out more about the Rockville Racers Swim Team! We hope to make 2019 a fun and positive experience for all the swimmers! For more information, and to ask other questions, please contact at rockvilleracersteam@gmail.com. The pool will be open regular summer hours through Monday, September 3. After that date, the pool will be closed during the week, then open the next 2 weekends. This Friday, August 3, 2018 is South Anna Elementary School Staff Appreciation Day. All SAES staff members are invited to come out to the pool to enjoy a day of sun and relaxation. You do not need to be a member to join us. Please sign in at the gate and pay $5 guest fee. If you are a staff member at any other school, please consider joining us as well! It’s that time of year again! New members, if you’ve been considering joining, now is a great time! Join now, swim for the rest of the summer and save $200 (you don’t pay the one time initiation fee). This allows you full membership benefits during the rest of the 2018 season. When you join in 2019, you are already an Active Member. Please contact us at membership@rockvillecenter.com if you have any questions. Looking for a great way to kick off the July 4th week? 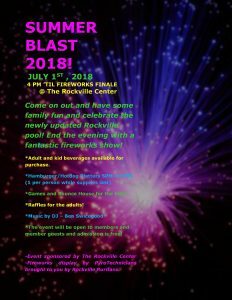 Why not come out to the Rockville Center on Sunday, July 1 for our Summer Blast! The pool will be open starting at noon and the festivities begin at 4 p.m.
Dinner (hamburger or hotdog and sides) will be provided between 5 p.m. and 7 p.m. One plate per person please. We’ll also have raffles, games, a bounce house for the kids and a DJ! The pool will be open until 8:30. 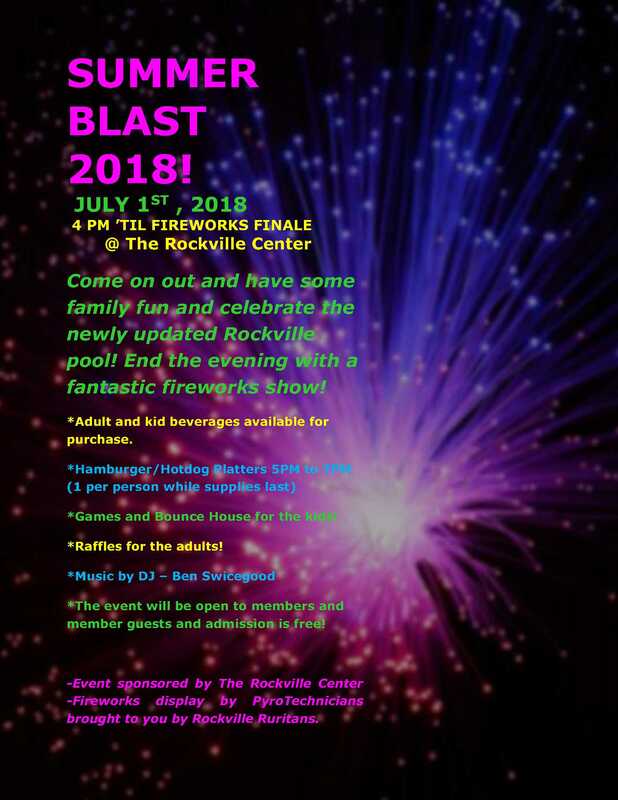 After that, we’ll head out to the parking lot (bring a chair) for a Fireworks show sponsored by the Rockville Ruritans. Guests welcome (use your guest pass or pay $5 at the gate)!